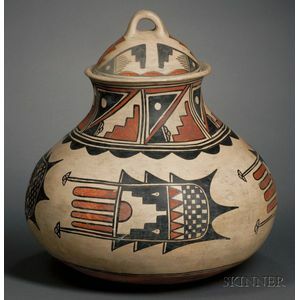 Large Southwest Polychrome Pottery Jar with Lid, San Ildefonso, c. 1905-15, attributed to Martina and Florentino Montoya, the bulbous form with flared neck and lid with handle, with dark red and black stylized geometric devices on a cream-color slip, (hairline crack, part of rim broken and re-glued), ht. 18, dia. 16 in. Note: This large and beautifully painted San Ildefonso storage jar is attributed to Martina (1856-1916) and Florentino Montoya (1858-1918). 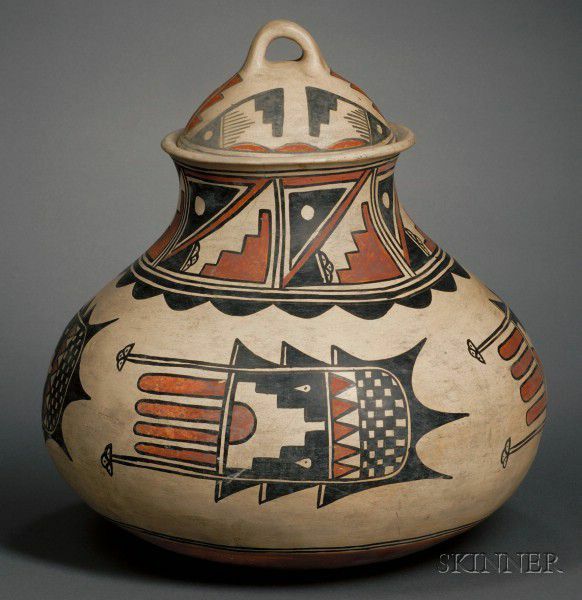 The polychrome vessel dates c. 1905-1915 and stands 18 in. including the lid. According to Kenneth Chapman, Martina was from Cochiti and Florentino was from San Ildefonso. This duo inspired major innovations in pottery style and techniques. Spending much time in Cochiti before permanently moving there between 1902 and 1905 according to Jonathan Batkin, the potting team was introduced to the Cochiti slip, bentonite. This slip was much easier to apply and they were able to polish it quicker with a rag as opposed to the painstaking stone polishing process. They introduced the bentonite slip to the San Ildefonso potters whom rapidly adopted it. Although there are no documented examples of their pottery being signed, their pottery is very identifiable. Mr. Batkin lists design characteristics of Florentino's painting as having negative arcs, circles, bars and triangles along with large stepped designs, outlined scallops and checkerboard motifs. The above vessel has most of these elements. Furthermore, the jar has a cream slipped rim top and is slipped down tot he bottom while the red hot band beneath the double framing lines near the bottom is omitted. These were changes that Martina and Florentino introduced. This jar has been slipped with bentonite and the surface shows the characteristic parallel lines caused by rag polishing. Finally, the vertical and slightly outward flaring neck is a specific feature introduced to San Ildefonso potters by Martina. I believe her inspiration could have come from examining some of the large jars made at Cochiti in the 1880s. For a complete study of this couple, please refer to the article printed in American Indian Art, Autumn 1987 by Jonathan Batkin, titled "Martina Vigil & Florentino Montoya, Master Potters of San Ildefonso and Cochiti Pueblos".